Beer Sheva Thoughts: Techunix Ruled! 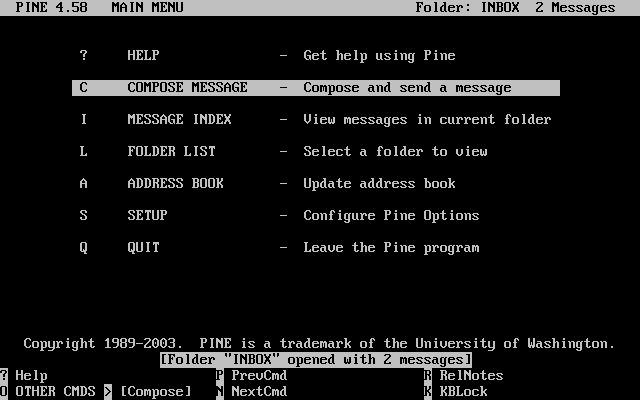 Googling Techunix I found out that different people may mean different things when using it, so for the purposes of this blog post, I mean the Unix Server that used to do Pine mail at the Technion institute of technology. For long spells of time I thought it was the coolest mail server ever! I mean I was a student for the longest time, and I had free mail! Cool! Then I stopped being a student, the year was 2000 or so, and I thought they would let me keep my mail forever, but no! I had to get mail from my ISP. I had to pay for it, and where was that cool thing of accessing your mail from everywhere? Then along came Gmail with its 1GB of free space. I was ecstatic. This was not only mail, it was also a backup of all my files! I begged my friends and finally got an invite in 2004. Immediately I invited anyone who asked for an invite. I took me several months to switch all my mail to Gmail, but from 2005 - I never looked back!